Nice memory --- the early years of marriage and anniversary celebrations...... getting all dressed up for fancy dinners at a favorite restaurant, surprise gifts for each other (and my husband is good at surprise gifts!! ), and time together. This year, our 34th was a fun weekend. Our daughter Heather, her husband David and granddaughter Emmalee took us to our fancy dinner out at Mario's in downtown Detroit - a good restaurant that has been around for a long, long time. It was a 34th celebration for Heather too because she is Jim's daughter and I adopted her a year after we were married. 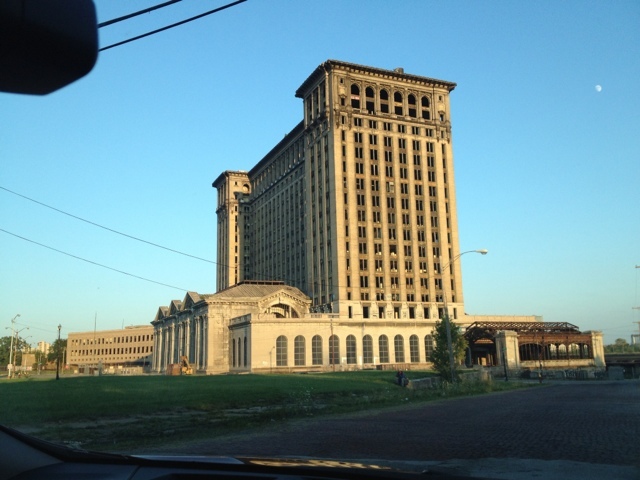 We also drove around downtown Detroit and were excited to see all the activity. Jimmy Buffet and Lionel Richie were in concert at the ballpark. There were people everywhere. It was sad to drive by the old ballpark location - an empty, fenced-in lot, but good ole Corktown looks like it's stayin' alive. I used to work in downtown Detroit, my husband and his family would make fun trips to downtown Detroit when he was young - to shop, to eat at the Hudson's tea room, etc. I hope it becomes a vibrant city again.....the architecture on many of the buildings is beautiful! ANYWAY, our actual anniversary was the 29th and we spent the evening with our 3-year-old granddaughter Emmalee at Chuck E. Cheese!!! I've gotta admit, it was a special evening!! p.s. 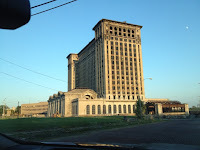 The building above (former Michigan/PennCentral Depot) is broken down, falling apart and one of my favorites in Detroit because I saw part of it in a beautiful stage in the mid-70s. It is privately owned now and I hope it's restored to its glory!! Just received my issue of Martha Stewart Living and Corktown has a two-page article!! Very cool for Detroit!